A day or two before I went into labor, my mom and I went to the grocery store. 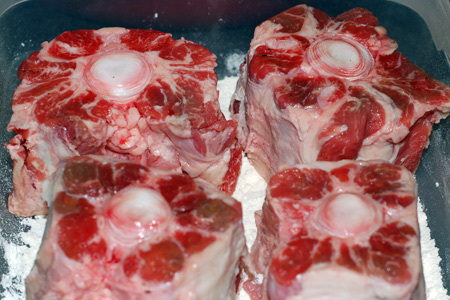 As I was browsing the meat counter considering some meal options, I noticed several packages of oxtail, and would have hopped up and down with glee if I hadn’t been 41 weeks pregnant. I’d never cooked with oxtail before because I couldn’t find it anywhere, but it was one of those cuts that I had always been curious to try out. Needless to say, I snapped up several packages and determined to make them into an oxtail ragu, some of which could be frozen for after the baby’s birth. That Friday—Good Friday this year, as it happened—I ended up taking the day off of work to run some errands with my mom. I spent the morning getting the oxtails braising so they could simmer away while we were out and about. At 5pm, on the way back home from the fabric store, I felt two strange snaps in my belly and thought perhaps my water had broken. I didn’t notice any fluid leaking, but shortly afterwards I started having contractions so mild I still wasn’t convinced it was actual labor. 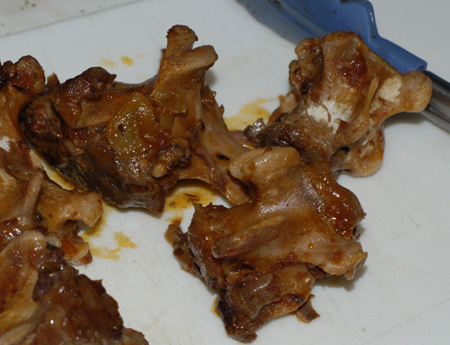 To be on the safe side, though, I wanted to take it easy: I asked my mom to shred the meat from the oxtails and reduce the sauce, and Jeremy to photograph the neat-looking bones and boil up some pasta for dinner. 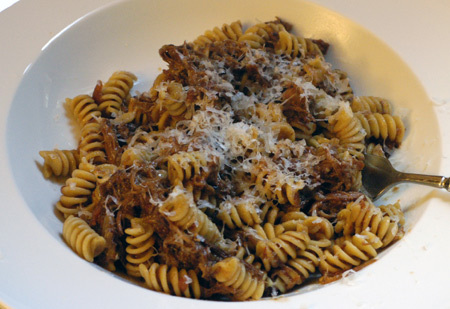 We ate our very tasty dinner of rotini with braised oxtail ragu around 7pm after deciding to cancel my scheduled non-stress test because I was probably about to have a baby. Our doula suggested over the phone that we go for a short walk and try to get some rest afterwards, but by the time we got back from the walk, I was in active labor and could no longer get comfortable. We never did time the contractions, but they were pretty close together and I had the chills. We asked our doula to come over, and I breathed through contractions and drank about 3 quarts of water while we waited. Shortly after arriving, she reminded me to try and use the bathroom, and everything really sped up from there. I had bloody show, and was trying to stand through the next contraction when I suddenly felt intense pressure and it was time to leave for the hospital (this was about 10:15pm). By the time we got to the hospital, it was nearly impossible to talk during the contractions and the walk from the turnaround to the birth center door seemed to last forever. The delivery room was chaotic, and I was kind of relieved not to be wearing my glasses (my mom brought them along for me to wear afterwards). I labored on my left side facing Jeremy and Stacey while the nurses asked admission questions (a little irritating), strapped on the external monitor belts (painful because I didn’t want my belly touched), pulled off my shirt (they never could get me into a hospital gown though), and did an internal exam (I was 7-8cm upon arrival and definitely in transition). They gave me oxygen, saying the baby wasn’t tolerating the contractions well, and tried putting IVs first in my left then my right hand, but they both just blew out as soon as the saline drip was hooked up. Jeremy advocated for me, and I ended up getting sips of water between contractions instead. The contractions were so intense that I had several bouts of nausea and kept forgetting to breathe, but Jeremy and Stacey were right there to help me focus. 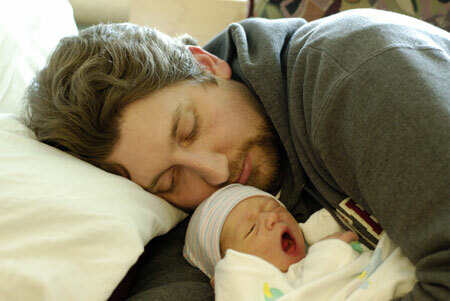 In what seemed like no time, I was complete and was rolled onto my back to start pushing. The fingers on my left hand were all numb, which made gripping my knees a little difficult, and my calves kept cramping; but the contractions spaced out enough to give me a breather between pushes, and Stacey and the doctor coached me on how to push more effectively. I don’t think I pushed for much over an hour, and then my little boy was on my chest at 12:17am, all 7 lb 2.3 oz of him. He scored 9/9 on his Apgars, and Jeremy remembered to ask that the cord cutting be delayed until it stopped pulsing. I did have a 2nd-degree natural tear and something like 6 stitches, but was really surprised by how quickly I recovered from the birth, and how little pain I was in. My throat was really sore (whether from the nausea or the vocalization, I’m not sure), and all the muscles in my upper body were incredibly sore for two days. My IV bruises were actually almost the worst part, because the fingers on my left hand stayed tingly for almost a week, and the bruises didn’t disappear entirely for about a month. My bleeding diminished rapidly, however, and I think I could have been discharged after 24 hours. We ended up staying in the hospital for three days because our little Nolan was not much interested in eating, and lost 9% of his body weight in 48 hours (he weighed 6 lb 8.5 oz at discharge). 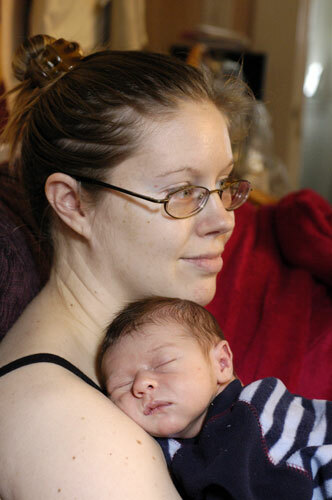 We had several discussions with a lactation consultant because he was such a lazy eater and a difficult latch. As a result, we’ve ended up on a regular pumping regimen, which is tiring but working out alright: Nolan is gaining weight like a champ, and I have had enough supply to feed him breastmilk exclusively, which I consider a huge triumph. 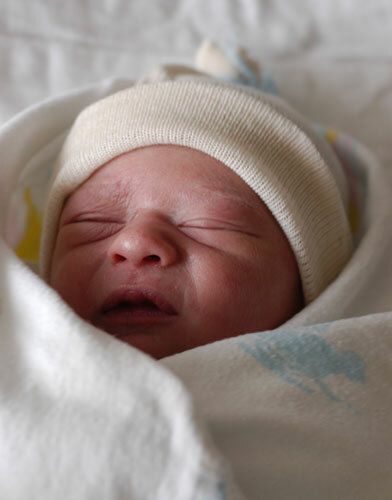 All in all, the most surprising thing was just how quickly the entire labor happened, and how similar it was to my mom’s labor timewise (she was overdue, went into natural labor around 5pm, and I was born around 12:30am via forceps and episiotomy). Once I knew I was really in labor, it lasted just another 5 hours. As a first-time mom, I was much more mentally prepared to have a long, drawn-out labor than such a quick, intense one, but once Nolan decided he was ready to come out, he meant business! It largely proceeded as I had hoped, however. 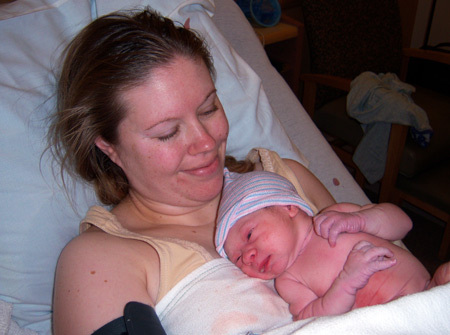 I didn’t go to the hospital until I was at least 7cm dilated; I didn’t have to wear an IV or hospital gown (not that they didn’t try); and most importantly, I had a completely natural labor, and asking for pain relief never even crossed my mind. We did have a pretty awful nurse during the delivery: apparently she actually threw a temper tantrum over the IV thing (threw down her gloves and slammed the door), but I was facing away from her at the time and otherwise occupied. She was rough with me and entirely unsympathetic after that, and seemed to be pouting. 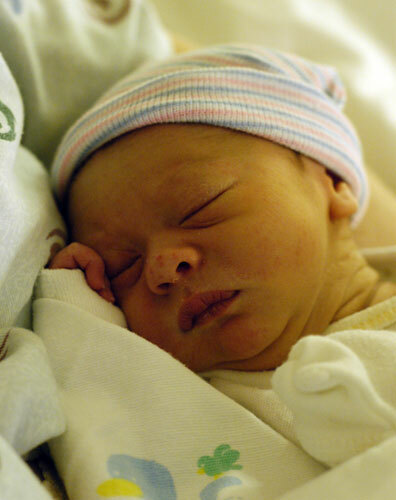 Thank goodness I only spent two hours or so in the delivery room! Stacey and Jeremy encouraged me not to focus too much energy on her, and the great nurses on the recovery floor totally made up for her bad attitude. Oh, and the leftover oxtail ragu froze beautifully! I can’t remember now exactly what I did, but it was based on Mario Batali’s recipe in the Babbo cookbook, meant to be served with gnocchi.